If you have been looking to find the perfect human embodiment of the term ‘beauty and brains’ then you have just found her; her name is Ella Mielniczenko! Smart, beautiful and highly industrious, Ella Mielniczenko is a BuzzFeed executive producer who is responsible for thinking up ideas that have revolutionized the media company over the years. Ella Mielniczenko is credited with being the woman who managed to launch BuzzFeed’s flagship channel on Snapchat Discover. She also helped to develop BuzzFeedViolet, the company’s first-ever scripted video channel. Her charming personality and highly infectious smile have endeared her to people over time. Apart from being known as a very industrious and productive person, Ella Mielniczenko is also known by many people for being the girlfriend of Hannah Hart, a very popular YouTube star. Ella Mielniczenko was born on the 25th of September in 1986. She was born in the city of Los Angeles, California, USA. Although everyone now calls her Ella Mielniczenko, her birth name is actually Micaela Mielniczenko. She changed her name much later for professional reasons. The identity of Ella’s parents has not been revealed. Also, it is not known if she has siblings or if she is an only child in her family. Ella has always been an active person and it is on record that when she began high school, she joined the soccer team as well as the softball team where she tried to show how talented she was in the sports. She was also active in the environmental club as well as the student vote initiative. When she finished high school, Ella decided to go abroad to study in Siena, Italy through the University of Virginia. However, she eventually graduated with a Bachelor of Arts degree in Visual Media Arts from Emerson College, an institution based in Boston, Massachusetts. Following her graduation, she has gone on to do great things for herself, building her career as a video director and producer. Fans have been craving more information about Ella Mielniczenko. We bring you interesting facts about the talented content creator below. Ella Mielniczenko joined BuzzFeed, a very popular millennial news and media company in 2013. She joined the company as a content creator and became quite exceptional at her job, winning accolades from the managers. About three years later, in 2016, Ella rose through the ranks and became an executive producer. She continues to work in her position as an executive producer at the company to date. In her capacity as an executive producer, Ella Mielniczenko has managed to revolutionize the company. She became the woman to develop BuzzFeed’s first ever video channel called BuzzFeedViolet and also went on to launch BuzzFeed’s flagship channel on Snapchat Discover. Ella Mielniczenko has also been credited for creating a talent initiative called the BuzzFeed Creators Program, which is aimed at helping BuzzFeed staff members build personal social channels. Ella Mielniczenko is an openly gay woman who is engaged to Hannah Hart, a famous YouTube star. Hannah is the creator of My Drunk Kitchen, a popular series on YouTube which has garnered lots of followers over the years. The duo met in 2016 and fell in love with each other. They then started dating and often showed themselves off on their social media pages. 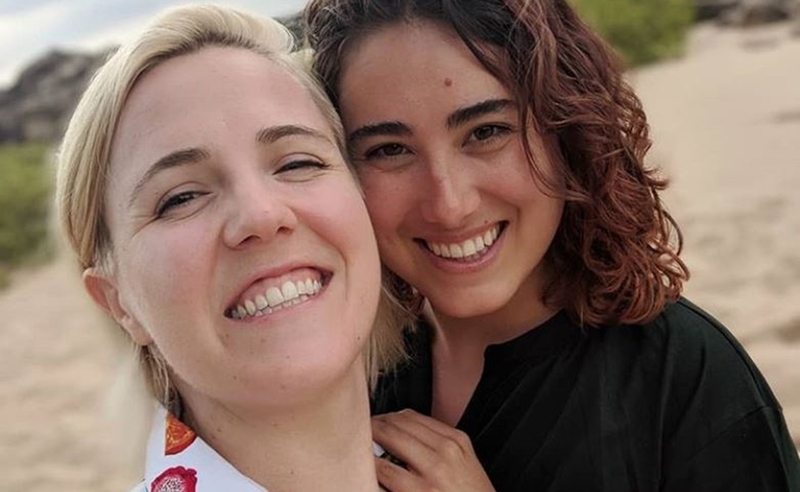 They finally got engaged in 2018 when Hannah Hart proposed to Ella Mielniczenko. The proposal took place at a beach in Hawaii while the couple was vacationing in the city. Hannah used the opportunity to pop the big question and Ella accepted. Their many fans are now waiting for the day they will get married. Ella Mielniczenko has not only been an executive producer; she has also been a director and an actress as well as a script supervisor for some video projects. She is known for directing Unfortunately Ashly, a popular comedic series from Buzzfeed Motion Pictures which is followed by many people. Mielniczenko is also known for the work she did as a script supervisor in Cocktail Party, 2016 drama movie. She has also made several appearances on Hannah’s YouTube videos. Followers of Ella Mielniczenko on Instagram know that she is a huge traveler. This is because she often posts photos of herself while visiting different places around the world. Apparently, traveling is one thing that gives her joy as she loves to explore different places and go on adventures to where she has not been before. Ella Mielniczenko is expected to have raked in some considerable amount of wealth for herself over the years, considering how hard working and industrious she is. As an executive producer at BuzzFeed and as a director and script supervisor, the young woman has been able to make a fortune through the years. However, her exact net worth at the moment is not quite certain. Some sources have pegged her net worth at $1 million but this is yet to be verified.